If you had told me last year that I would be juicing pretty much anything and everything, I would have told you to back off and stop making weird predictions. Also, out of all the things you could predict with your psychic gift, you should give me something juicier than becoming a juicer. Maybe tell me that I am coming into a fortune, or that I will have really great hair for all of 2013. Tell me that my dog will be perfectly trained and stop trying to gorge herself on the cat-box Tell me that Pajama Jeans are now finally in fashion for reals and I should really just woman-up and buy them. I would welcome any of these predictions. I am constantly doing highly scientific research google searching new vegetables and fruits to juice according to their benefit on the body. It turns out red cabbage is really good for you. It is packed with vitamin A , C and vitamin E, which helps boost your immunity! Who else has been feeling this pesky cold and flu season? I feel like I am perpetually on the precipice of getting sick. We need all the help we can get. If it takes juicing a cabbage, I am so on board. I will not lie to you (do I ever? ), I was expecting this juice to be funky. You have smelled cabbage. It smells sulfurous. People usually shred it into salads or drench it in mayo to make a slaw. I was just going to extract this sulfurous juice and pour it down my gullet. There would be no mayonnaise or no flavor-concealing, Asian-inspired salad dressings. I braced myself and just bit the bullet. Anything for vitamins. Down the hatch it went. Turns out I was just being a real drama queen. Not only is this juice pretty (I mean, look at that color! BAM!) It is totally delicious. I should really stop being such a baby. This recipe will make about a pint and a half of liquid love. Wash, prep, cut into manageable juice-able pieces and send them all down your juicer. Bottle the juice up in airtight containers or better yet enjoy it right away! Don’t wait more than 48 hours to enjoy your fresh juice! Is it bad that reading this post makes me want to juice more? And, you know, actually get a quality juicer that doesn’t leave more than half of the veggies/fruit as a mess that is NOT juice? Because, yeah, I’m definitely feeling that right now. 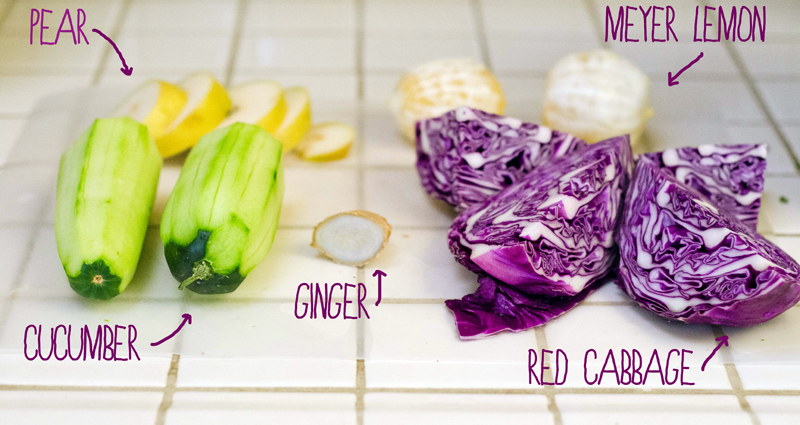 Like you, I would be scared to try cabbage in juice… but it’s awesome to hear that it is actually pretty darn tasty. And should I ever decide to try out the whole juicing thing, I’m gonna give this recipe a go because it sounds like something I should drink, especially since I am always on the verge of being sick. Oh, Erin. Juicing is amazing. I am obsessed (if you can’t tell.). I started with a less than efficient juicer that would vibrate and sometimes shut off every time I put something leafy (like kale or chard) into it. It was kind of a nightmare and I didn’t even really realize it until I got something better. Having a new machine makes so much of a difference. It feels luxurious! This cold and flu season has been ridiculous! What is the deal? I feel like everyone has contracted some form of the plague multiple times. Not amused. Not amused at all. I’ve never juiced before but am working on getting healthy…even if I wasn’t, the color of this juice makes me want to drink it. Actually I really want to wear it! Do you make nail polish? I have a Magic Bullet juicer attachment. It’s all sitting in my garage waiting for me to use. This might be just the thing. Thanks for a beautiful recipe! I’ll def give it a try. Yes, the color would tempt a ‘no veggie’ kid to try some before passing a judgement. I’m sure it tastes good. Will give it a try. I’m ready to try anything to keep the flu at bay. Thanks, Sridevi! Yeah, this flu season is really something. I would run pretty much anything through my juicer in order to keep those nasty bugs away!! Hey Gina! I just have to say that this is one of the prettiest juices that I have ever seen. I love that vibrant pink color 🙂 I might have to give it a try and I do love that you threw some ginger in there as well. I’m addicted to ginger in my green juices right now! Thanks so much for the recipe! I was searching online for a cabbage recipe since I just heard it’s good for calming the stomach and this one popped right up! Can’t wait to try it. Quick question, though….why do you peel the cucumber? When I juice, I just toss the whole thing in there. This looks yum. Did you have any gastrointestinal discomfort after drinking the cabbage juice? That’s a good question, Bridge. I was totally thinking that might happen, but I felt completely fine. 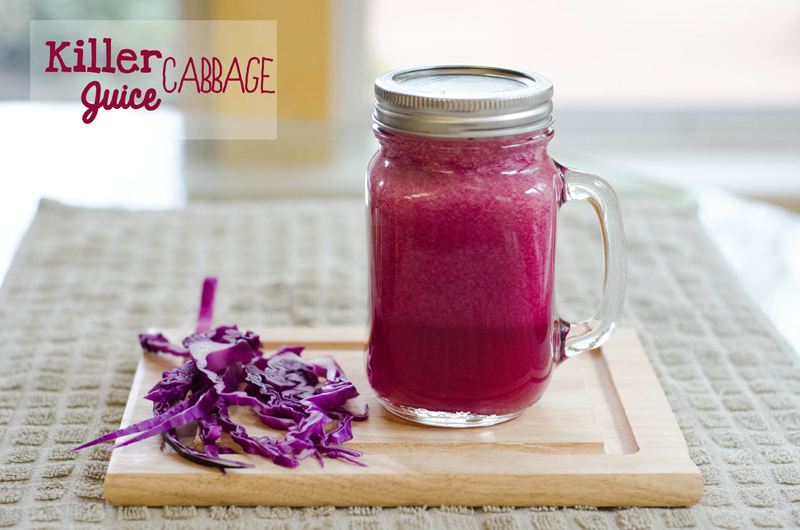 When reading about it, I have seen that cabbage juice is actually recommended to aid in digestive health. Weird, yes? I’ve tried the juice this morning. Very pretty. Its good but I think I may need a bit more zing possibly from apples. Definitely will experiment with various combinations with the cabbage. Its good because I still have half a head left. Besides ginger what else would be a good substitute to include? I’m not a big ginger fan. I wish I was but I tend to get headaches thinking about the smell of them. This is my recipe. Red cabbage, watermelon, lemon, apple and ginger. Very delicious. I use my Vitamix instead and I get 64 oz. of delicious juice. I add red cabbage nearly every time I juice, usually with Kale, chard, ginger, english cucumber (unpeeled), parsley, carrots, a pear or apple, half a lemon unpeeled, broccoli & celery. I was curious why you recommend to peel the cucumber? I buy the un-waxed english version and believe you get more nutrients with the skin. Nice post. I have been juicing for a couple of years now. The cabbage is an amazing addition. My favorite has everything juice (it isn’t pretty) 1/2 head cabbage, 3 carrots, two pepers red/green, 3 tomatos, 3 stalks cellery, 3-4 kale leaves, 1/2 bunch celantro, 1 lemmon. All of that makes about two quarts of juice; enough for the day usually. I am guilty of adding a pinch of salt. It looks uggly but tasts pretty good. And talk about feeling full and satisifed; amazing, never had more energy. Keep up the cool posts. For the benefit of Indians reading this post, if you add some chaat masala and a pinch of sugar to this juice, the taste is even more flavorful. Just tried your Killer Cabbage Juice. It is so good and beautiful too! Thanks for saying it was actually good! Just made the juice! It was awesome. I used one pear and one small organic green apple. This is my second favorite now. Thanks! This sounds awesome. One thing though, will this work because I have a Ninja, not a juicer, juicer. I really want to try this out and incorporate into my diet. Looks like you and I discovered nearly the same recipe! Mine includes a whole grapefruit rather than pear, and I also work some celery in there. I’m a grapefruit fiend and I find that the bitterness of the red cabbage and the grapefruit are very similar/complimentary. I love it over a lot of ice so I can enjoy it nice and cold, drinking it gradually. I have not been juicing for very long, but I find that this juice above all others that I’ve made gives me tremendous energy and an almost euphoric feeling! I’m convinced that the red cabbage has super powers! I LOVE purple cabbage and a few grapefruit…taste great! Its highly recommended to consume the juice right away. I have heard fresh enzymes start dieing after 30-60 minutes of juicing.